A great value for tea drinkers! This pack includes 54 bags of delicious Hawaiian Tea: 18 bags of Hawaiian Breakfast, 18 bags of Maui Passion, and 18 bags Island Fruit. Excellent as a gift or for your own teapot. 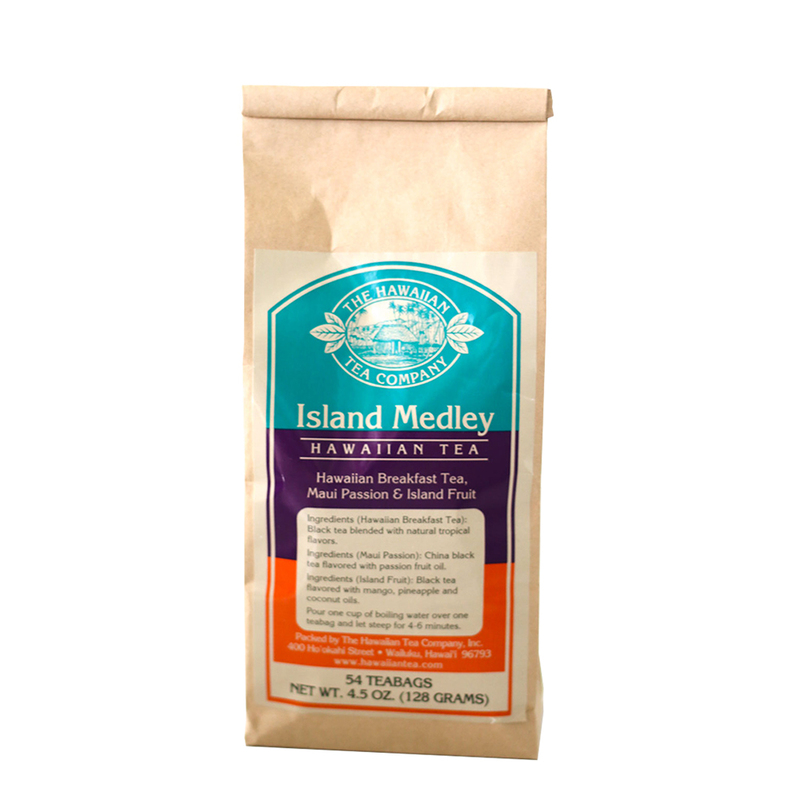 Hawaiian Breakfast Tea: The traditional breakfast tea tradition combined with a light tropical essence. China and Ceylon black tea blended with natural tropical flavors. Maui Passion: A soft black tea with tangy tropical hints. China black tea infused with passion fruit. Island Fruit Tea: A golden burst of tropical flavors and caffeine. Orange Pekoe black tea flavored with mango, pineapple, and coconut oils. From Charles Wyatt of Tomball, Texas on 2/6/2018 . My wife an I tried our first pick which was Island Fruit and we both really enjoyed it. Based on our first sampling, we will be back to order more. From Anonymous of Pontiac, Illinois on 1/15/2018 . This is the second order of tea (had to try other styles). As with the first, all the tea within are wonderful. Also, shipping is actually very quick considering the distance. I look forward to going through them and re-ordering more. Mahalo!! From Anonymous of Loveland, Colorado on 11/19/2017 . We love the 3 teas and enjoy different flavors. Each one is unique and very satisfying.